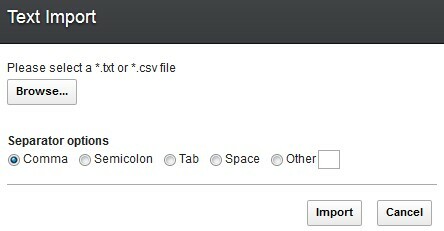 You can import a text file such as a .txt file or a .csv file to a spreadsheet. In an open spreadsheet, click File > Import. Click Browse to select the text file that you want to import. Select the separator that you defined in the text file. The separator must be an ASCII character. Note: If a text file contains data such as date, time, currency or percentage, the data are automatically recognized as numbers in the appropriate formats when the text file is imported to the spreadsheet.